F This Movie! : Happy Thanksgiving from F This Movie! Happy Thanksgiving from F This Movie! Although Thanksgiving is a foreign concept to me, I truly am thankful for F This Movie! It's a podcast that keeps me awake and sane on long worknights behind the wheel (I listen to several casts but FTM is the one I most look forward to each week), but it's also a community where I feel like I belong and you people (both the contributors and the F-heads) feel like friends, even though I've never met any of you. So thanks for that everyone. Haven't really posted here much, but I would like to say that today I am very thankful for the F This Movie! podcast. For the past couple of years, listening to you guys banter about movies I love, movies i don't love, and movies I don't give a crap about has gotten me through some rough times. You are all great to listen to and I look forward to every episode! (Though here's a shoutout to Adam, whose weird sense of humor has made him my favorite co-host.) Patrick's dedication to doing the podcast every week is truly an inspiration. That's real commitment, and surely it can't be easy, but it is really, really appreciated. I hope one day you figure out a way to make this a full time job, you deserve it. 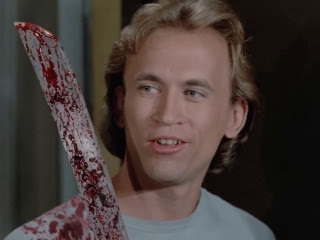 That said, I am most thankful for Mike, who is not afraid to tell the world that his favorite movie ever is Friday the 13th part 7. It was the first horror movie I ever saw as a kid growing up in Mexico. It holds a special place in my heart. Fly that freak flag hermano! Episode suggestion: Neverending Story, the first movie I remember seeing in the theater is probably responsible for my lifelong obsession with movies. Seconded, for the Neverending Story suggestion! Thinking of watching 'Ravenous' with the family after dinner. My mom's a big guy pearce fan. I am liam neeson. Unknown! Wanted to wish everyone a fantastic turkey filled and not too bloated thanks giving. And hopefully it is cranberry sauce. I really need to watch that movie. We are thankful for all of you, whether you celebrate Thanksgiving or not!